If you have built the largest supercomputer in the world, which the Japanese government has (once again) done with the 10.5 petaflops K supercomputer, the one thing you can't do is have it sitting there being idle. So Fujitsu, which built the K machine, has been making the rounds of the Japanese universities and is peddling PrimeHPC FX10 supers, which actually have twice the number-crunching oomph per server node, to get techies coding apps on local (and generally smaller) machines that will then be let loose to run at scale on K.
The K super installed last year at the Rikagaku Kenkyusho (Riken) research lab in Kobe, Japan, is the most powerful computer on the planet. Fully loaded, K has an astounding 864 server racks, holding 22,032 four-socket blade servers that have water cooling blocks on the processors and main memory in each blade. The system uses the eight-core "Venus" Sparc64-VIIIfx processor, designed and etched by Fujitsu itself and running at 2GHz; K has a total of 705,024 cores to run applications. The server nodes are linked through the homegrown "Tofu" 6D mesh/torus interconnect. The Japanese government could upgrade the K super, of course, but it is highly unlikely it has the funds to do so. The original budget for K, when it was a combined vector-scalar machine, was $1.2bn; it is not clear how much the K as delivered cost, but it was no doubt many hundreds of millions of dollars. Just up the road from Riken, Kobe University has bought a baby K system for its new Graduate School of System Informatics, which was just established in April 2010, and to make use of the collaborative agreement between the university and Riken that was inked on May 15 that will give researchers at Kobe University access to the K super. 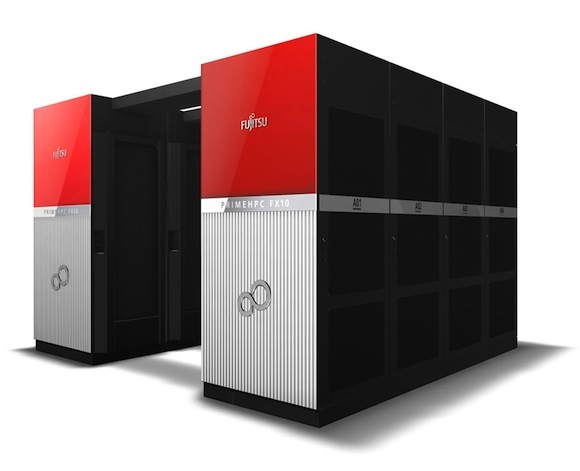 In a sense, the 96-node PrimeHPC FX10 super that Kobe University is acquiring from Fujitsu is akin to a workstation for researchers to create code upon, which they will then dispatch to the monster K machine. This baby K+ cluster will have two Fujitsu Eternus DX80 storage arrays with a total of 120TB of capacity as well as 40 Fujitsu Esprimo K552/D desktop workstations to act as consoles for the super. This 96-node FX10 machine has a peak theoretical performance of 20 teraflops doing double-precision math, which used to sound like a lot but doesn't these days given that a Tesla M2090 GPU coprocessor from Nvidia can give you 665 gigaflops. But the programming model on K and a ceepie-geepie hybrid are radically different, so you can't exactly code on one and port to the other. In April, the "Oakleaf-FX" supercomputer based on the PrimeHPC FX10 iron and Tofu interconnect, was fired up at the University of Tokyo's Super Computing Division/Information Technology Center. Delivering 1.13 petaflops of oomph, this machine has 50 racks holding 4,800 server nodes. By any modern measure, this is a very large super in its own right, but again, the main purpose is to develop codes that can scale across the much larger K machine. It would be interesting to see the Japanese government sprinkle funding for seed FX10 machines around its major universities to drive more computing on the K super. If enough science could be done on K, it might be possible – and politically expedient – to upgrade the K machine with more powerful Sparc64-IXfx processors and a Tofu interconnect stretched to many tens or even perhaps hundreds of petaflops. If there is such a plan, neither Fujitsu nor the Japanese government have hinted at it. Given the nationalistic nature of supercomputing, is that the K super and its FX10 commercialized machines is unlikely to garner much attraction outside Japan. China is building its own MIPS and Sparc supers based on its own CPU designs, the United States has Cray, Silicon Graphics, IBM, and now Nvidia to support (as well as Advanced Micro Devices and Intel on the processor side), and Europe already has a hodge-podge of machines and architectures in its largest supers. It will be very hard, but not impossible, for Fujitsu to sell FX10 machines of any size in North America or Europe.